The NYPD dispatched additional officers to TV stations across the city as a precaution after a television reporter and photographer for a CBS affiliate in Roanoke, Virginia, were executed by a gunman during a live television report Wednesday, a spokesman for the department said. The department developed a number of precautionary counterterrorism initiatives in the wake of the terrorist attacks on Sept. 11, 2001, including the deployment of critical response vans to certain locations, which was the measure it planned to implement Wednesday, the spokesman said. The enhanced security is being ordered out of an abundance of caution and is not related to any specific threat against media in New York, authorities said. Alison Parker, who just turned 24, an on-air reporter for the Virginia-based news station, and Adam Ward, 27, a photographer for over four years with the team, were gunned down during a live interview just before 7 a.m. on Wednesday at a shopping center in Moneta, Virginia. Ray Villeda reports. Alison Parker, 24, and Adam Ward, 27, were shot at 6:45 a.m. Wednesday while doing a live report at the Bridgewater Plaza near Smith Mountain Lake, according to the Franklin County Sheriff Department. Vicki Gardner, the head of the SML Chamber of Commerce, was shot in the back and is in surgery, according to Roanoke.com. She was later listed in stable condition. “My heart goes out to all those impacted by the shooting that took place this morning near Moneta, Virginia," Gov. Cuomo said in a statement. "Like all of you, I am shocked and saddened by the senseless murder of two members of the media who were doing nothing more than their jobs." Mayor de Blasio called it "such a senseless loss of two young lives." Graphic footage posted online shows Parker listening to Gardner talk about local tourism when someone fires at least eight shots outside the frame. Parker screams and moves out of the view of the camera. The camera drops to the ground and captures what appears to be a fleeting image of the shooter. The person is wearing black pants and a blue top and appears to be holding a handgun. Authorities identified the shooter as 41-year-old Vester Lee Flanagan II. According to WDBJ7, Flanagan, a former reporter for the station who professionally went by Bryce Williams, shot himself near mile marker 17 on on I-66 in Fauquier County. He died a short time later. 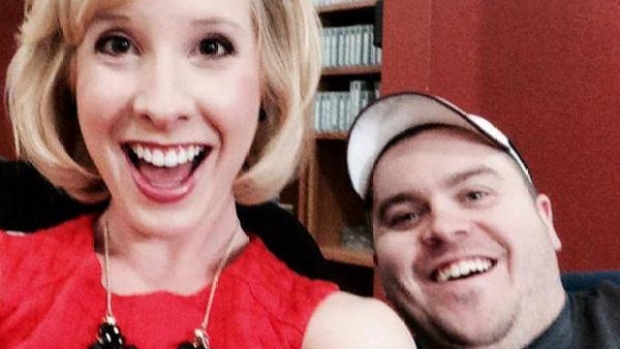 The station, WDBJ7, confirmed the deaths of its employees on Twitter. A man claiming to be the gunman in the Virginia TV news shooting praised past mass killings like Virginia Tech and Columbine and says the racist shooting in Charleston at a black church was why he acted now. Jonathan Dienst reports. "We love you, Alison and Adam," the station said. According to the station website, Parker was a morning reporter. She graduated from James Madison University in Harrisonburg, Virginia, and was news editor of its recognized newspaper, The Breeze. She also had been an intern at WDBJ-TV. The TV station also linked to her Facebook page, which says Parker spent most of her life outside Martinsville, Virginia. Parker previously worked at WCTI NewsChannel 12 in Jacksonville, North Carolina, near Marine Corps Base Camp Lejeune. She was an avid kayaker and attended community theater events in her spare time. “We were together almost nine months. It was the best nine months of our lives. We wanted to get married. We just celebrated her 24th birthday,” he tweeted. The man who killed a television reporter and photographer during a live television broadcast shot himself along a Virginia interstate Wednesday morning. Ward, a graduate of Virginia Tech, according to the station, was also engaged to be married, Hurst said.